“The Met” Fashion House, Day Spa, and Salon on St. Armands Circle without question has one of the most beautiful storefront/entries in the entire area. 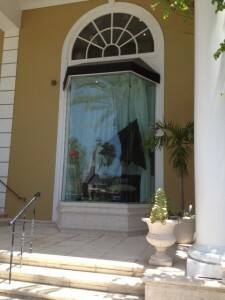 An elegant stairway set between two huge display windows beckons passers-by to come in out of the hot Florida sun and indulge themselves in luxury – whether it be shopping for mens or ladies fashions, or hours of pampering in the day spa. However; “pampering” isn’t the word that comes to mind when you see what the sun can do to the valuable merchandise displayed in the twelve-foot-tall bay windows at the front of the store! Facing west into the afternoon sun, the heat coming through the glass can quickly ruin everything on display, fading fabrics, and causing discomfort throughout the entire front area of the store. But how do you protect against heat and fading when the ability to see into the display windows is your most important sales asset? If you are the management at The Met, you call Solar-X of Sarasota! We were able to give them just what they needed – a nearly undetectable window film that would reduce heat and virtually eliminate the ultraviolet light coming through the windows – without any loss of ability to see the displays, and no color change. Goods that would typically have to be written off due to damage are able to be sold without loss. Despite the challenges posed by the confined space within the display windows, our experienced installation craftsmen were able to apply the film at a quality level that is second to none, and without any disruption of normal store routine – something that is always appreciated by management personnel! If you have a retail business where fading and sun damage is a serious issue, but you simply must have uncompromised display capability, Solar-X of Sarasota has a complete line of extraordinary products for you. And; as always those products will be installed with unrivaled quality and attention to detail by the area’s most experienced installation craftsmen. Contact Solar-X today for a free consultation if you’re getting tired of losing valuable merchandise to damage from our hot Florida sun. We’ll put our 40 years of industry experience to work protecting your valuable goods, storefront and office space. You’ll like our quick delivery, too – because when it comes to fading; time is money! 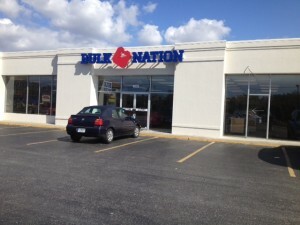 Serving the Bradenton, Lakewood Ranch, Sarasota, and Venice area since 1973. Rated “A+” by the Better Business Bureau. Tropical Storm Debby has brought torrential rains, and some powerful squalls to our area over the last few days. There is some localized flooding, a few trees are down, and lots of smaller limbs and branches are covering peoples’ lawns and some roads. It’s a perfect time to think about installing a Safety and Security window film such as Armorcoat® to the windows of your home or office. When a squall comes through your area bringing lots of rain and wind, knowing that you have Armorcoat® protecting your windows can bring real peace of mind. 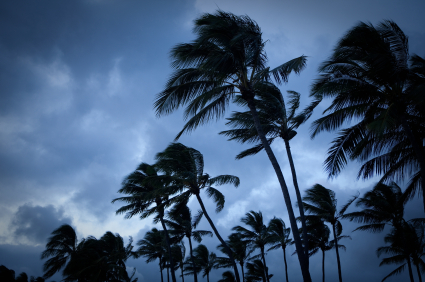 Armorcoat® can provide a significantly elevated level of protection when gusts of wind carry small branches, organic debris, or any other loose items; and send them flying – possibly shattering glass and driving rain into your home or place of business. It is the perfect basic protection against weather events such as Debby. Of course, Armorcoat® protects against more than foul weather. It can provide an effective deterrent against home invasion or burglary by holding glass in place and making entry more difficult; and “sun control” versions reduce heat, glare and fading as well – making your home or office more comfortable and energy-efficient, as well as providing an increased level of safety. If your home or place of business could use a higher level of security as well as a “dose of comfort,” contact Solar-X of Sarasota today for a free no-obligation estimate. We’ve been making people safer and more comfortable since 1973. We’ll help you choose the right film for your project and install it with the attention to detail that only the area’s most experienced installation creftsmen can provide. The premier window tinting contractor in Sarasota, Bradenton, and Venice; Solar-X of Sarasota is rated “A+” by the Better Business Bureau. Commercial buildings are the leading consumers of energy and produce 39% of all CO2 emissions. As a result, forward-thinking facility managers and property management companies are actively seeking to make those facilities more sustainable. Energy-saving practices are being put in place, and budgets prepared for the purchase of proven, sustainable products that will improve building environments and reduce utility costs. 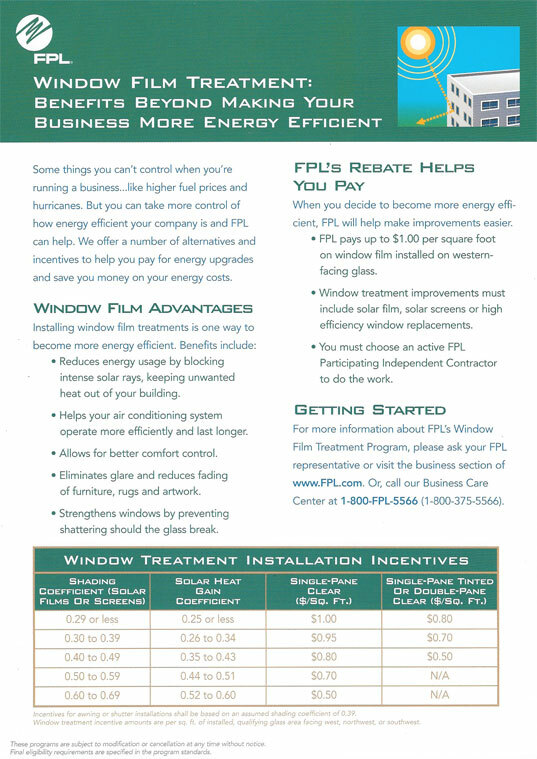 Carbon-negative window films such as SolarGard®, and SolarGard® “Panorama” can help facility managers achieve their goals; and substantial utility rebates can “jump start” savings from the day the film is installed! 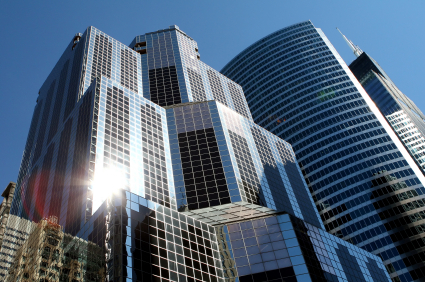 SolarGard® and Panorama® window films reduce heat input into buildings by as much as 82%; making interior environments cooler and more comfortable. Improved comfort conditions and reduced glare make employees more productive; and the 99% reduction of harmful UV light shields employees from premature aging of skin and even skin cancer. Managers who want these benefits and an elevated level of physical security may want to consider SolarGard® “Armorcoat” Safety and Security Film as an affordable “upgrade.” For those who are trying to achieve LEED certification, SolarGard® products may qualify for LEED credits in multiple catagories. Finally, buildings that focus on sustainability are more attractive to prospective tenants; posting higher occupancy rates than competitors who are less energy efficient. Sustainability means lower operating costs, and that means big savings for tenants over the course of a long-term lease! Solar-X of Sarasota is well equipped to work with facility managers or property management companies in helping them achieve their sustainability goals. 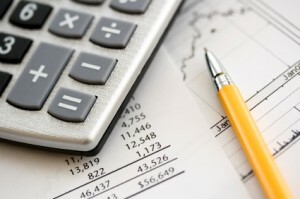 Proprietary modeling programs can outline potential energy savings and ROI. We’ll work together with clients to determine which film best meets their needs, and we’ll install that film with an attention to detail that will please the most discriminating buyer. Contact Solar-X today. 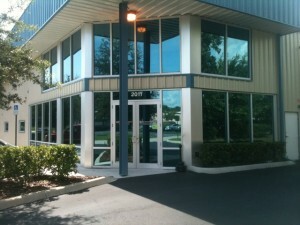 We’ll focus nearly forty years of industry experience on your project – in Sarasota, Bradenton, Venice, or statewide. Rated “A+” by the Better Business Bureau. Heat intrusion into a building can wreak havoc with interior comfort conditions. Work spaces near windows can become unbearable, and unwanted glare can make it virtually impossible to see computer screens; resulting in a substantial loss of productivity. An installation of quality window film such as SolarGard®, Panorama®, or Armorcoat® can immediately change all that. These industry-leading products will reject up to 82% of the total solar energy, and will protect bulding interiors and inhabitants by stopping 99% of the harmful ultraviolet light that causes premature aging and skin cancer. And Armorcoat®; with its impact resistance and aggressive adhesive will add an elevated level of safety and security from dangers of all kinds. Most importantly, these high quality films can save 30% and more on energy consumption – and that saves money! 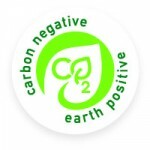 SolarGard® and Panorama® films are carbon-negative; they qualify for LEED credits in multiple categories, and can provide a better return on investment than low-e windows when comparing cost of installation and performance. Installation is quick, quiet, and non-disruptive to office routine. And delivery time is immediate – no waiting for permits, window tear-outs and replacements, no dust, no noise – so savings can begin right away! Solar-X of Sarasota has been actively helping building managers save energy for nearly four decades. Our experienced staff will get the job done right the first time, and move smoothly through the job with absolute minimum disruption to personnel. 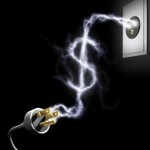 Start 2012 right, by taking control of your runaway energy costs. 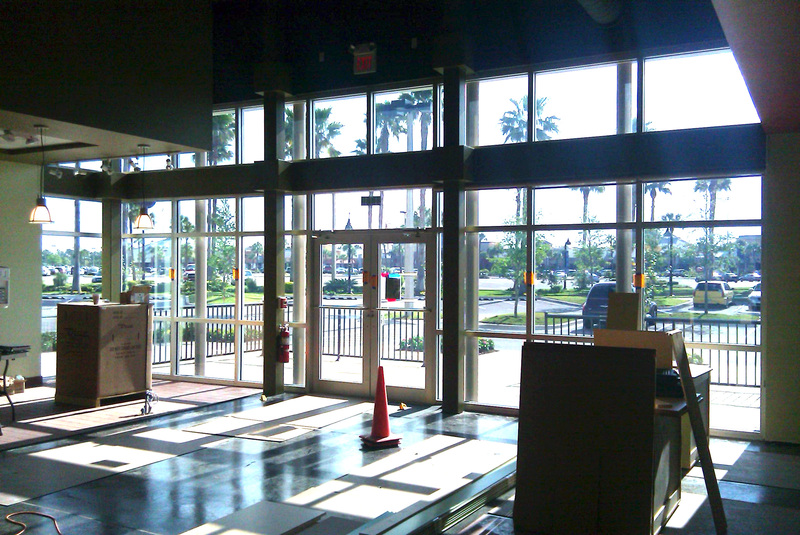 Whether you are in the Sarasota, Bradenton,or Venice area; or if you need an experienced commercial window film contractor statewide, contact Solar-X today. In the nearly thirty-nine years that Solar-X of Sarasota has been in business, a commonly asked question is, “Don’t you think that sooner or later, you’ll run out of customers?” Our answer is a resounding “No!” Why would we? Every year, millions of square feet of architectural glass are manufactured in this country. It will go into homes and offices across this land, and inevitably, the sun will shine through it and cause discomfort, or glare; fading, or a safety issue that someone will need to contend with. And window film will address them all with a quick, easy, and affordable installation. …”Well, what about all the tinted, low-e, and insulated glass being manufactured today? Won’t that cut into your market share?” Not really. 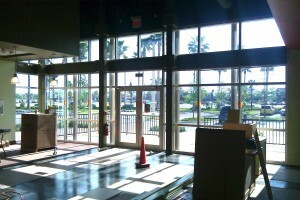 For while there have been advancements in the “energy-saving” and “comfort” performance technology of glass, there have also been advancements in the window film industry; and quality films like SolarGard®, Panorama®, and Armorcoat™ are being installed every day on these more modern glazing systems. Why? Because they can significantly boost the performance and safety aspect of even these newer glass products. Improvements in optics, performance, appearance, and lifespan have; over the years, elevated window film to a level of respect and product consciousness that matches any glazing technology out there. Homeowners and Facility Managers alike are increasingly recognizing the utility and quality of these products; and they are installing them in ever-increasing numbers. Window films can stop up to 82% of the sun’s heat, reduce glare, and eliminate over 99% of all the ultraviolet that is so harmful to furnishings and skin. Performance certifications from respected third parties such as the National Fenestration Rating Council (NFRC) add further legitimacy. Run out of customers? No way! Over 38-plus years, we’ve seen our share of economic upheavals. 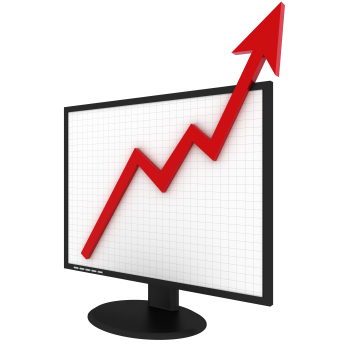 But the overall “trend line” on our sales graphs is always “up,” not “down.” And we intend to keep it that way – with high-quality, advanced technology window films and the outstanding customer service for which we have always been known. 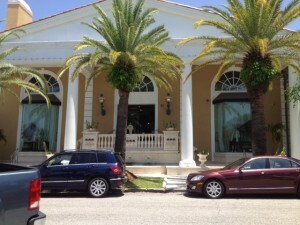 For the best in residential window tinting in Sarasota, Bradenton, Lakewood Ranch, and Venice; or statewide commercial contracting, contact Solar-X of Sarasota today – the area’s premier window tinting contractor since 1973. Rated “A+” by the Better Business Bureau. It’s Labor Day Weekend! Up the coast on Cape Cod, Long Island, Nantucket and Martha’s Vinyard, people will be closing up their “summer homes” and getting ready for the Fall and Winter weather. But here in Florida we still have plenty of hot summer weather left to contend with. That means the sun is still blasting through windows and glass doors; causing severe discomfort and fading of drapes, carpeting, furniture and artwork. But you won’t have to put up with sun-related issues like that if you install a quality window film such as SolarGard®, Panorama®, or Armorcoat™. SolarGard® and Panorama® films will stop up to 82% of the sun’s heat and glare; as well as 99%+ of the harmful ultraviolet rays that can ruin your interior furnishings – and your skin! With a minimum SPF factor of 285+, these efficient yet affordable products (recommended by the Skin Cancer Foundation) can protect you, your family, and your home from the damage and premature aging associated with ultraviolet exposure. And of course; by stopping up to 82% of the sun’s heat from overloading your air conditioning system, you will enjoy comfort you only dreamed of, while saving up to 30% and more on your electric bills. Armorcoat™ Safety and Security Film not only stops heat, glare and fading, but brings an additional level of protection to your windows by helping to keep the glass in place if broken by things such as accidental contact – even by attempted burglary or unexpected winds. All you need to do is contact Solar-X of Sarasota for a free, no-obligation estimate; and you too can enjoy all the comfort, energy savings, and safety benefits that our high-quality window films can provide. At Solar-X we have been providing the best in products and installation for nearly 40 years. Home– and business owners alike know our reputation for “top shelf” products and unmatched installation craftsmanship. 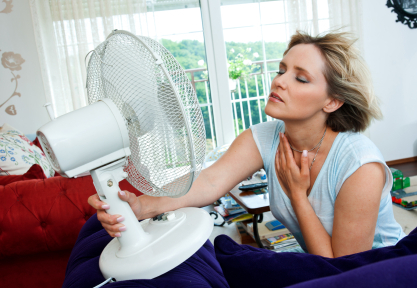 Our films will keep you cool, comfortable, and protected for years to come, so contact Solar-X today. The area’s leading window film contractor since 1973! Even before Ackerman Plumbing moved into their new location at Whitfield Park Loop, they knew they were going to have to do something about reducing the heat that was pouring through the sixteen foot tall windows on the East and South side of their building. The windows let in a wonderful amount of light; but in order to function as a comfortable and productive space, management decided they had to get pricing on installing window film. They were hoping that window film could reduce the heat input and still preserve the pleasing effect of the large and airy window area. 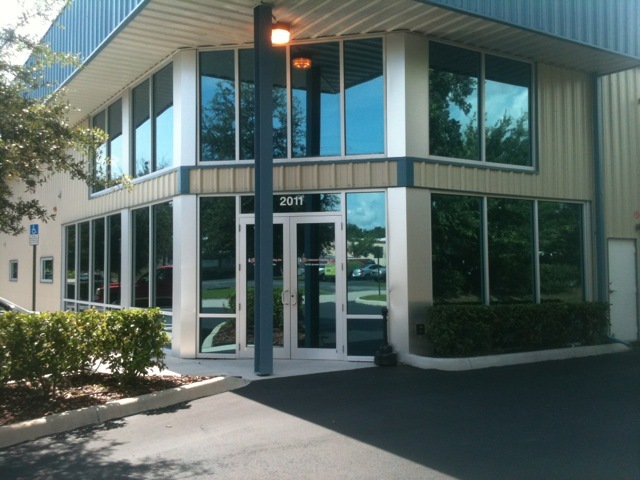 Several window film contractors were called, and after careful consideration, Solar-X of Sarasota was chosen to install SolarGard® “Silver 20™” window film. Solar-X has been providing expert commercial installation to our clients for nearly forty years; and Silver 20™ is the classic “workhorse” window film. No frills; high performance – stopping 79% of the sun’s heat, glare, and 99% of the harmful ultraviolet light. The attractive, softly reflective appearance modernizes the building, providing daytime privacy and a uniform architectural appearance. Now, the interior space is not only comfortable, it is fully usable right up to the windows. The softly reflective surface of the film adds to the overall appearance of the building. Most importantly, Ackerman Plumbing is saving “about $100.00 per month” on their utility bills, based on what the former tenants were paying. That puts the payoff period at about two and a half years. Comfort and Savings is what we at Solar-X do best! In Sarasota, or anywhere in Florida – for expert commerical installation, top quality film products, and timely delivery – contact Solar-X today. 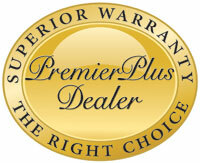 The area’s premier window film contractor since 1973. When Panorama® Window Films were introduced a little over a decade ago, the manufacturer was committed to the goal of creating a premium quality product, and marketing it through an exclusive network of top-quality window film dealer/contractors. These dealers would be equally committed to providing premium quality installation and service. They would be thoroughly well trained and held to a higher standard of professionalism than other dealers; so as the Panorama® brand matured in the marketplace, customers would know that they were getting the best window film available from the best dealer in the area. That original idea has evolved into the most formidable program in the window film industry. All Panorama® dealers in the network are hand chosen, and must adhere to the strict standards set out by the manufacturer in order to maintain their “active” status. Panorama® is the only window film brand that requires their dealers to participate in a continuing education program covering subjects such as the latest in glazing technology, proper film-to-glass matchups, understanding air conditioning systems, or the light spectrum – from harmful ultraviolet to heat-producing infrared. 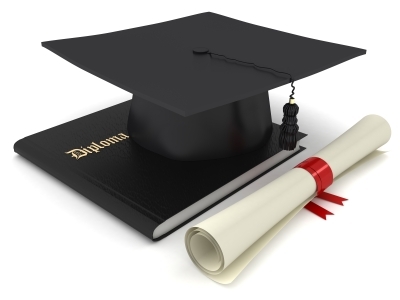 Likewise, our installation technicians are required to train at the manufacturer’s training facility in order to maintain the most stringent standards of installation quality and be certified as Panorama® Installers. Solar-X of Sarasota is the area’s exclusive Panorama® dealer – one of the first in the country chosen for the program. Our pride in meeting and maintaining the standards required of us permeates every aspect of the way we conduct business. Product knowledge and timely installation, plus unmatched quality and customer satisfaction have helped make us the area’s leading window film contractor since 1973. Whether your project is residential or commercial, you can count on the professionals at Solar-X every step of the way – from initial sales consultation to installation. Contact Solar-X today, and let us bring our brand of professionalism to your project. 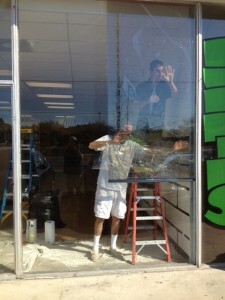 Expect – and get – the very best window film and customer service from Solar-X of Sarasota. 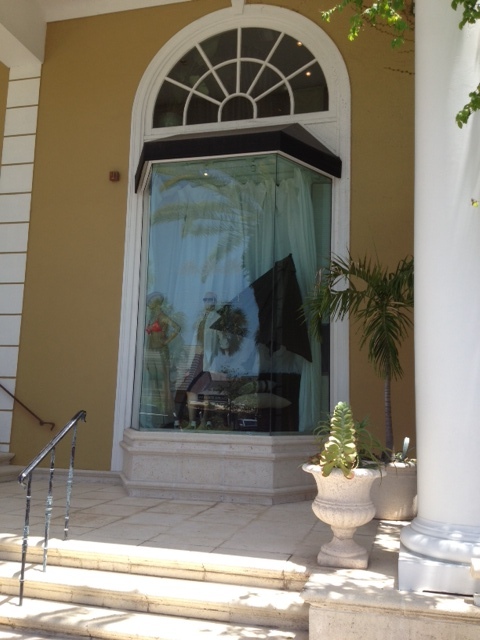 To start, we are a SolarGard® “Panorama®” window film dealer. That means we have an exclusive right to sell what is arguably the highest quality window film in this business – Panorama® – from an acknowledged industry leader – SolarGard®. expertise and their superior level of customer service. choosing a product that best suits your individual needs. warranty coverage available in the industry today. 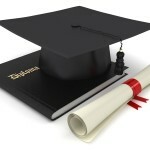 There are many other reasons – almost too numerous to mention – but they all add up to one thing. We can provide you with “top shelf” products, service, and unparalleled quality of workmanship. If your home is located in Bradenton, Sarasota, Venice; or you wish to avail yourself of our Florida-wide commercial contracting service, you should contact Solar-X of Sarasota today. Expect – and get – the very best! Facility Managers today are increasingly looking at window film products to cut energy costs in their buildings, increase occupant comfort, reduce the glare that makes it harder to see computer screens; and in some cases, provide a measure of safety. And quality products such as SolarGard®, Panorama®, and Armorcoat™ can do all these things at a reasonable cost. May Eliminate Window Replacement: Window film can turn ordinary windows into high-performance units without the cost and chaos of extensive window replacement; and provides a better return on investment than low-e glass. Reduced “Demand” Charges: During peak usage hours, power companies charge much higher “demand” rates – and these can really add up fast. In fact, they can be a dominant factor in overall energy costs; and since film works to lower the energy consumption associated with cooling system overload, high “demand” usage can be cut substantially. Adds Life To Tired Systems: A far more subtle form of savings can come simply from the reduced strain on the HVAC system. Machinery and equipment lasts longer, with far fewer costs associated with maintenance. Systems that are less efficient, old, or inadequately sized for the heat load entering through a building’s windows may be more than adequate after an installation of film that can stop up to 80% of the sun’s heat. Window film is far less expensive than replacing a building’s HVAC system, and may defer the cost of replacing that system for years! 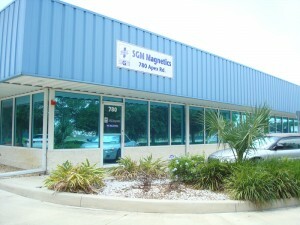 Solar-X of Sarasota has been helping Facility Managers control utility costs since 1973. If you are looking for substantive information regarding energy cost reduction, we can help with modeling tools that allow us to accurately determine your energy savings before installing your window film. 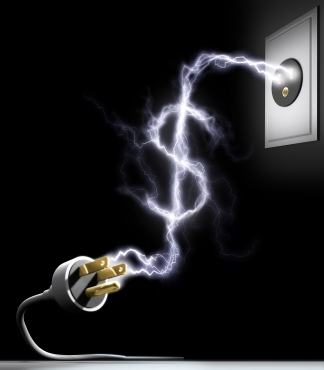 We’ll assist you in obtaining cash incentives and rebates from your utility company that will “kick-start” your savings. And we’ll provide you with the highest quality window films, industry-leading warranties, and unparalleled workmanship from true professionals. Local, or statewide. Contact Solar-X today. Commercial Energy Consumption Will Soar Worldwide. and can even be done at night. windows and frames – no dumping in landfills. • Low cost. Installation is extremely affordable. and long product life ensures continuing positive cash flow. emissions at the source – the power plant. different categories! EPAct tax credits too! No other energy-saving product offers so much at such an affordable price! Installation is virtually immediate; and can be done independently of any other “grand scale” cost-cutting projects such as lighting upgrades, or HVAC replacement. Choosing the right brand of window film is important too. Quality film products such as SolarGard® and Panorama® are the only brands available that have been scientifically proven to be “carbon-negative.” Manufactured under strict ISO 9001:2008 and ISO 14001:2004 quality standards, these exceptional quality window films are available from Solar-X of Sarasota to our commercial clients locally and across Florida. We can assist you in getting available utility rebates; and help you in your planning with accurate building information models; using proprietary software to aid in determining return on investment. Contact Solar-X today. We’ll put you on the “fast track” to long term energy savings! 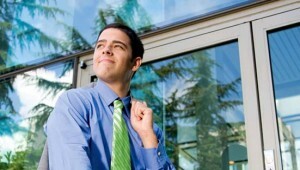 2011 Budgets Should Include “Carbon-Negative” SolarGard® or Panorama® Window Film. So the new year has arrived and you’ve been tasked with reducing your company’s energy costs. Where do you look to start “cutting?” Well, the three most important areas to look would be lighting, HVAC (air conditioning and heating), and the building envelope (windows). If your budget is too small to even consider the first two, we would submit that an affordable installation of quality SolarGard® or Panorama® window film could be your ticket toward substantial savings. SolarGard® and Panorama® films have been shown to reduce air conditioning costs by as much as 30%. Studies have concluded that these films provide a better return on your investment than low-e glass! And they can be installed right on your existing glazing without the high cost of window replacement – or the environmental impact of disposal of the old windows in a local landfill. 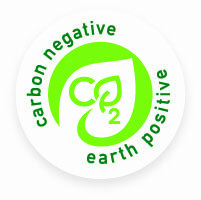 SolarGard® and Panorama® films are “carbon-negative.” Right from the start, they save far more carbon emissions than were created or expended in manufacturing the film. Their performance is certified by the National Fenestration Rating Council (NFRC). And you can start saving right away, because delivery is fast – with no disruption of office routine. SolarGard® and Panorama® films qualify for LEED credits in multiple categories, and many utlities; such as Florida Power & Light, have cash incentive programs that will immediately reduce your installation costs. And these top quality films can can be “piggybacked” with other technologies to help you get tax credits under EPAct. Solar-X of Sarasota; with 38 years of industry experience, is the area’s largest and most active SolarGard® and Panorama® dealer. We stand ready to assist you with building information models, technical information, and assistance in getting utlity rebates. Contact us today for an initial consultation. In Sarasota, Bradenton, Venice, or statewide; we’ll be glad to provide you with products and installation of unmatched quality. “Artisans” – a boutique located on beautiful St. Armands Circle – is stocked front-to-back with unique and delightful decorating items for home interiors, displayed in an eye-catching way to passersby who stroll the sidewalk in front of the store. However; old, deteriorating security film on the display windows was creating an eyesore that needed to be removed. Savvy marketing and display people; store management knew the old film “had to go,” as it was severely detracting from the attractiveness of their efforts. Since they were doing some “remodeling and refreshing” of the area near the display windows, it was a perfect time to get estimates for new window film. 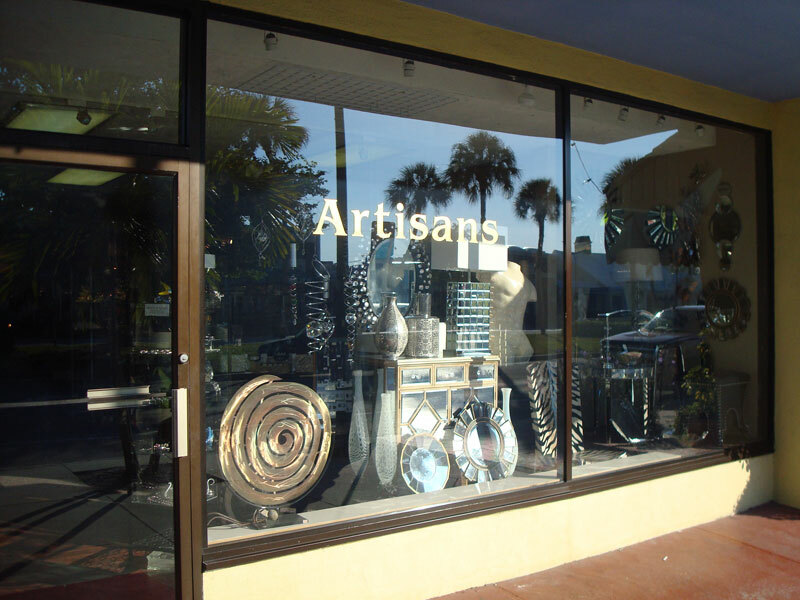 Window film has an impressively long service life, but the existing material on the storefront had definitely seen its best days – and it had not been particularly well installed originally! Dust and other contaminants were visible under the film that had been there since “day one,” and the overall deteriorating appearance was very unattractive. The experienced installers employed by Solar-X are “artisans” themselves – well trained craftsmen who take pride in the quality of their workmanship. A consultation with Solar-X convinced management that we could be counted on to restore the appearance of the display windows and achieve a level of attractiveness that would encourage window shopping and browsing. 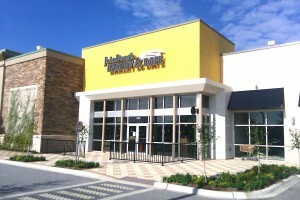 Since the store would not be closed during the remodeling or film replacement projects, it was imperative that the installers perform their jobs with little or no disruption of routine. Close proximity of customers to the work in progress demanded strict adherence to safety standards. Again, the experience of our installers ensured the smooth completion of the project – on time and schedule – and management couldn’t be happier. The new 8mil clear Armorcoat™ Safety and Security Window Film delivers an improved level of protection against accidental contact, break-ins, or windborne debris from storms or unexpected violent weather. The crystal clear material is virtually undetectable to passersby, and by screening 99% of the ultraviolet light, the store’s interior is protected against fading and other sun damage. If you are contemplating a window film project whose circumstances will require the highest levels of professionalism, you should call Solar-X of Sarasota today. One consultation with our professional staff will convince you that you have found the right company for your job – professional, creative, and intelligent individuals at all levels who will grasp exactly what you are trying to do, and get the job done smoothly and efficiently. All at a competitive price. That’s why Solar-X of Sarasota is the area’s leading residential and commercial window film contractor; since 1973. Call or e-mail us at any time for prompt, courteous service. Superior Heat Rejection Keeps Offices Cooler and More Comfortable. Despite the fact that there are blinds in every window at the offices of SGM Magnetics on Apex Road, the morning sun’s heat comes through the glass and window treatments like a laser; increasing the interior heat and discomfort to the point where it is intolerable. That’s when Julie Most started exploring the possibility of installing window tinting on the East and South windows. Smart businesswoman that she is, Julie called several potential film vendors for an estimate; but eventually chose Solar-X to do the work, based on our large selection of quality products, our reputation as a competent and trustworthy contractor, and the affordability of our products. Window Tint Controls Glare and UV. Based on our recommendation, SGM opted for a “dual reflective” product that stops 79% of the total solar energy. It softens the harsh glare; allowing office occupants to open their blinds to the point that they don’t feel completely “closed in.” It also protects people and furniture from the sun’s harmful UV light, and allows them to more easily see their computer screens. Most importantly, the heat intrusion that prompted Julie to call us in the first place, will now stay outside where it belongs! That’s what Julie said when asked if the film was performing as hoped, and if she was pleased with their new purchase. Not surprisingly, we hear that answer alot! Superior products, and 37 years experience in the industry ensure smooth, hassle-free installations and your total satisfaction. Contact Us for an estimate today!